1. Until further notice, no horses will be admitted on the grounds of Retama Park if they are coming from a county with a facility or racetrack that is under quarantine for the EHV-1 Equine Herpesvirus. 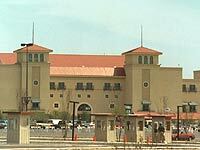 As of January 29, the racetracks currently under quarantine are Sunland Park in New Mexico and Turf Paradise in Arizona. in an EHV-1 quarantined county or adjacent county within the past 21 days. Any individual that is found to be responsible for a horse entering the grounds of Retama Park that does not conform to these conditions will be ejected from the grounds and will not be allowed to participate in any Retama Park race meet. For questions and more information, please contact James Leatherman, Retama Park's Racing Secretary, at (210) 651-7043.